Things are looking a bit different in our household lately, with the arrival of a daughter! A second child also meant that traveling around to Japanese adventures became much, much harder. My son is still young enough that walking around to activities all day still wears him out, and he often wants to be carried or pushed in a stroller, an impossibility if I’m also carrying my daughter. She’s not old enough yet to hold her head up independently and ride in a stroller seat without support, so using a carrier with her seemed like the only option – but that meant I had less room to maneuver if my son was having a massive tantrum needed some hands-on guidance. Enter the idea of a double stroller. I’d initially looked into adding a skateboard platform to the back of one of our three strollers, but for various reasons, wasn’t sure that would work. But let me back up to what ought to be the most shocking part of that sentence. That’s right. We’ve somehow, without noticing, become the kind of family that owns THREE strollers. This wild fact comes despite our two hours in Babies R’ Us prior to the birth of our son, frantically Googling and calling friends to get stroller recommendations and how we were determined to walk away with one universal stroller that fit all our needs. We started out with a Graco stroller that our car seat clicked into. It was far and away the simplest solution when our son was a newborn and transfers with a sleeping baby from a car to an activity needed to be seamless. This stroller also did travel duty – we’d clicked the car seat we’d need at arrival into the stroller and gate-check the entire contraption for more than twenty flights by the time my son turned two. When he was old enough to hold his head up – and I could start running to get back in shape – a BOB became a must-have. The BOB quickly earned first place in my affections and became our go-to stroller for all activities except travel. Seamless car seat transfers were a thing of the past, and the BOB’s bigger, sturdy wheels meant we could walk (and sometimes run) with ease through a neighborhood 10K or down the beach. Then we moved to Japan. And very quickly both the Graco and the BOB might as well have been boats for all they fit onto the Japanese trains. So we bought – you guessed it – yet another stroller. This one, a simple, lightweight umbrella stroller, was perfect for the trains, and it fit easily onto an escalator in a pinch, even leaving room for people to pass us, as is expected. Yet lately we’d noticed it sank heavily whenever our son sat down in it, and it was with dread that we realized he’d likely surpassed its weight limit. So when our daughter arrived, we began investigating double stroller options that would work to cart two kids around a big city with everything we’d need to survive the day. The stroller needed to be big enough to hold two children, yet small enough to maneuver through a train station and not get me murdered for being an obnoxious foreigner on a packed train during rush hour. It needed to be sturdy enough to withstand the ridiculous amounts of travel I do with two children, yet lightweight enough that I could carry it – alone – up a flight of stairs if our train station turned out to be sans elevator. After hours and hours of late-night research into “best double strollers for city,” I found a winner – the Joovy Caboose Ultralite Graphite. It didn’t look enormous, so I thought I would be able to take it out for our full days in Tokyo and Yokohama without attracting angry glares for the amount of space we took up. It had the word ‘ultralite’ right there in the name, so surely that meant I could lift it up a staircase if need be. And it had the option for my toddler to sit or stand, to continue my latest parenting trend of giving him acceptable options to choose from. Best of all, when it arrived, I COULD PUT IT TOGETHER MYSELF!!! I definitely poured a beer to celebrate when the assembly was over, but it honestly couldn’t have been simpler and didn’t even require any tools. Before long, we were taking our first outings in the city and giving this new stroller – our FOURTH – a run for its money. It’s exceeded my expectations. When we go out, we go out all day – which means we take practically enough provisions for the Oregon Trail and I’m on my own carting it all around like a pack mule. But we’ve packed two children, all our belongings, and diapers/food/water/toys into this stroller and hit the road and it’s been wonderful. Some subways in Tokyo don’t have elevators, and I’ve managed to easily fold this stroller up and tuck it under an arm as I let my toddler run ahead on the stairs and have my daughter in her carrier. On a recent outing, we strolled an extra forty minutes out of our way to a bigger, elevator-friendly station, and my son climbed right into his seat when he got tired – and I got my first calm window-shopping afternoon since we moved to Japan. We traveled from a meeting to a park, stopped to watch the ducks as we ate our bento-box lunches, then meandered through downtown Tokyo til it was time to head home. It was peaceful and perfect. Of course on it’s first outing my son chose NEITHER of the acceptable sit-or-stand options after a long day, instead insisting he needed to sit where his sister’s car seat rested, promptly pulling down the rain cover, and falling asleep with his head tucked into it. Which required me to move the car seat to the opposite side of the stroller, turn it sideways, and hope for the best. But it wedged in perfectly and everyone took a nap during the train ride home – which honestly was worth taking two kids out through rush hour into the city. (Don’t worry, I adjusted my daughter’s position shortly after taking this photo – it looked uncomfortable!). In my stroller research, I also discovered something I’d never noticed before: priority seating cars on the trains. Each train car has a few reserved priority seats, but in priority seating cars, several seats are removed to make space for wheelchairs and strollers. They’re easy to spot once you know what you’re looking for – the photos of wheelchairs & strollers. And although in Japan, you’ll never know if people are judging you because they are polite with eye contact, I felt a zillion times more polite on my end using a train car meant just for us. Looking forward to the day soon when our little girl can fully hold her head up and we can leave the car seat at home, but this stroller already has become an integral part of our family and helped me keep the adventures going, even with two very small kids on my own. *Huge thanks to Joovy for sending a stroller to Tokyo for us to test drive. It has absolutely lived up to everything my research had indicated and more – it’s become a little mini-home on our all day adventures, providing a bed for naps, a platform for exploring without tiring out, and a catch-all for the crazy amounts of diapers, snacks, waters, and toys necessary for entertaining two kids on hours of trains and big city sightseeing. Learn more at Joovy.com. Oh my, such a beautiful baby! I came across your blog via SavvyTokyo (great article re: independence, btw) which I also contribute to! I look forward to hearing more about your adventures in Japan! Congratulations on the new addition :). Oh, awesome! I knew your name sounded familiar – I’d love to meet up in person someday soon, we’ve been loving Japan and having adventures here! Oh my goodness! I’ve been searching for an article like this for weeks!! My second is due next year, and our first will be four when he/she is born, so after researching tons of sit and stands, we really feel like the Ultralight Graphite might be the one for us. 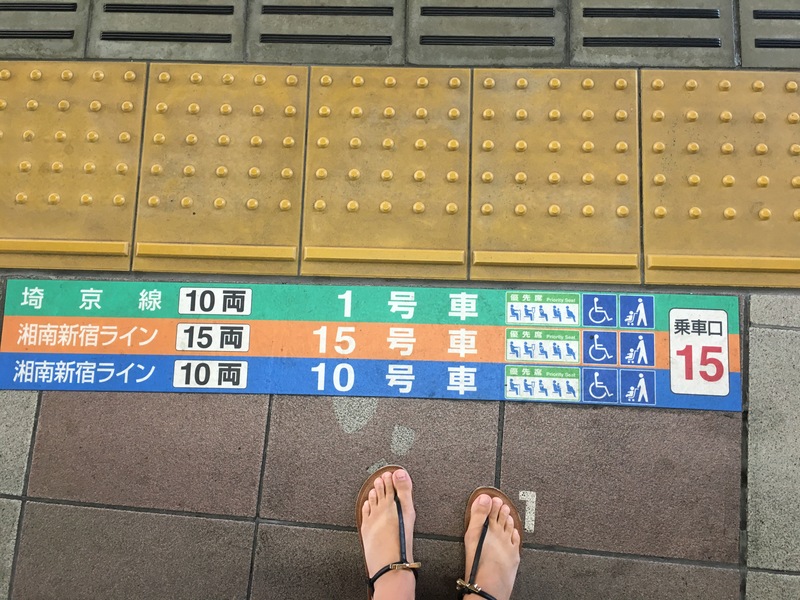 However, I can’t find ANYTHING that tells me whether or not it will fit through the regular gates (not the special wide ones) in Tokyo train stations. Your review was fabulous and very helpful, but can you tell me whether or not you were able to go through the regular gates? It does fit! You have to be sure the safety latch is down and properly shut but it fits. Some have been close (or I’ve had the angle off) so the safety latch is key – otherwise it starts to fold up! But we’ve taken it thru regular gates everywhere with no issues. SO glad to hear this was helpful! So you gyz had great fun in Tokyo. You have a wonderful family. It’s coincident that I have bought Joovy Caboose Ultralite single for Singapore tour. But it seems pretty much heavy than it supposed to be. Hope it will give good service. Thanks, Debra! The double is much lighter than other doubles – I’m not sure about the single. We LOVE Singapore – hope you are having fun! Thanks again for this review since most double strollers are targeted more for N. American environment so was hoping to find something we can really use here in HK. I should confess that we do in fact have TWO single strollers but both have never been used more than 5 times max since i’m too lazy to use it when i’m out alone with my kids. You are so welcome! The stroller struggle is REAL!